Where are the VBA installers? It’s no longer possible to download the VBA installer for AutoCAD 2013, AutoCAD 2012 and AutoCAD 2011 on Autodesk’s page “Download the Microsoft Visual Basic for Applications Module (VBA)” autodesk.com/vba-download. At this point they’re only available for AutoCAD 2014 and AutoCAD 2015. Here’s the explanation from Autodesk: “As of January 31, 2014, Autodesk is no longer authorized to distribute VBA 6 or earlier versions of VBA for use with Autodesk AutoCAD and other Autodesk products. This change affects the availability to download and install VBA for Autodesk AutoCAD 2013 or earlier, VBA remains available for Autodesk AutoCAD 2014 and Autodesk AutoCAD 2014-based products because those products support VBA 7.1.” (FAQ) Same with AutoCAD 2015. It’s just too bad this information is not directly seen on the download page where you end up on if you for example run the VBAIDE, VBALOAD, VBAMAN commands without having VBA installed. If you need VBA for AutoCAD 2013 or older, you will need to find an alternative download (might not be safe) or you need to upgrade to the latest AutoCAD release or migrate your custom programs to AutoLISP, ObjectARX, or Managed .NET (VB.NET or C++). JTB World can help with customization and migration work. The updated FlexNet (FLEXlm) version 11.12.1 (based on Flexera Software’s FlexNet Publisher 2014 R1) has been released and is now available as a public download as well as the updated License Administration Guide. Here are the news in Version 11.12.1 as far as I could find. There might be some bug fixes too that not are documented. “Binding in a Virtual Environment” subject has been updated on page 25. The text “Do not change MAC address of the virtual machine.” has been added as well. ACTIVATION_LOWWATER Controls the number of licenses that cannot be borrowed or transferred. ACTIVATION_ EXPIRY_DAYS Controls the activation request based on the expiration dates mentioned in options file during activation. lmgrd.exe, lmutil.exe and lmtools.exe are all version 11.12.1 now. It might take some time before vendors start supporting this new version but it most probably will work to update it if you for some reason want or need to do it. AutoCAD 2015 and other Autodesk 2015 products have recently been made available and thus there are a bunch of new FlexNet feature codes added to this page. AutoCAD 2015 feature code is 86295ACD_2015_0F. From within JTB FlexReport and the free JTB FlexReport LT you can use the button to get these new feature descriptions. Added support for monitoring of Reprise License Manager (RLM) usage. For RLM monitoring rlmutil.exe is used and is available for download here: http://www.reprisesoftware.com/enduser_kits/end-user-download.php You might need to run the installer and take note of installation folder to find it. Import of RLM license server report log is also available. Added support for monitoring of Venturis (TRICAD) license usage. Added support for monitoring of Ranorex license usage. 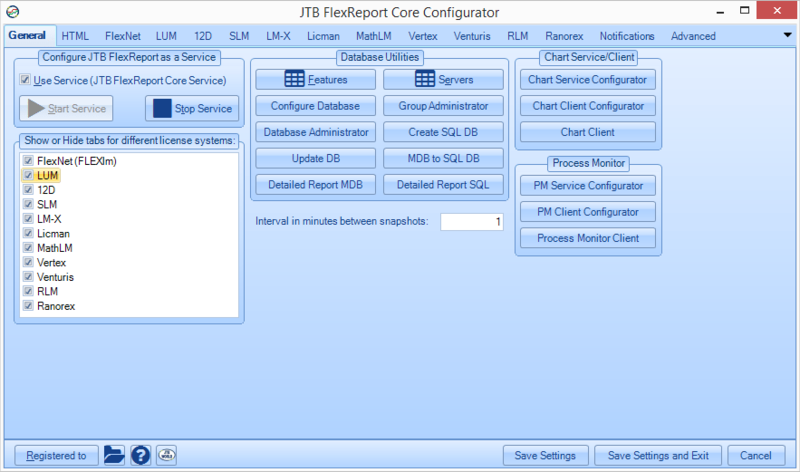 JTB FlexReport Config has got a large UI update. Email PNG reports automatically added to chart client. More settings available before a report is created on the Report Settings tab in the chart client. These are also use by the auto report functionality. More preset values for date ranges added in the chart client. Time frame is being used for Histogram charts now. <All> and <Unassigned> added to all list boxes in chart client where applicable to make it easier to make selections. Filtering added for lists in the chart client. Example: filter all features containing the text Auto. Improvements and bug fixes for the auto report functions. and much more added and fixed that can be found in the revision history. Here are the downloads and general upgrade tips. Contact us to get a time limited license file for free. You can try it in your environment with your real data for a few weeks with full functionality. Full support is provided during trial period. About JTB FlexReport: JTB FlexReport from JTB World is a report tool (HTML, chart and list reports) for applications using the FlexNet / FLEXlm (flexlm license manager), IBM LUM (IBM License Use Management), SPLM (Intergraph SmartPlant License Manager), SLM/Sentinel LM/Sentinel RMS/Sentinel Protection Server/SafeNet Sentinel, LM-X, Solidworks SNL License Manager, T-Systems license manager product LICMAN, Vertex Systems, MathLM (Wolfram Mathematica license manager), RLM (Reprise License Manager), Ranorex, Venturis, Primavera from Oracle or 12D software licensing. With Process Monitor any Windows application like Acrobat, Visio, Bentley MicroStation, single licensed AutoCAD or AutoCAD LT can be reported usage of. 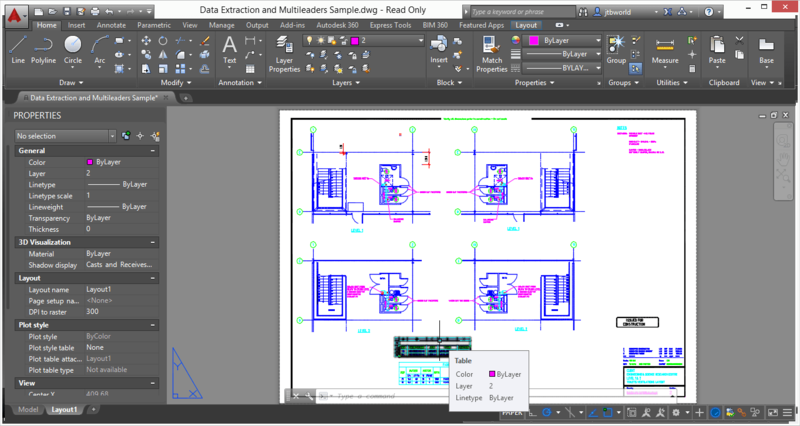 Autodesk AutoCAD 2015 was released last week and now available as trial too. As you can see AutoCAD has a new updated look with a the theme darker. There are also several nice new features to consider. I’m updating the page about AutoCAD 2015 so it’s not yet complete and I’ll post more about it later on too. Most JTB World’s apps will just work with AutoCAD 2015 as they are and where needed they soon will be updated to work fully with AutoCAD 2015.